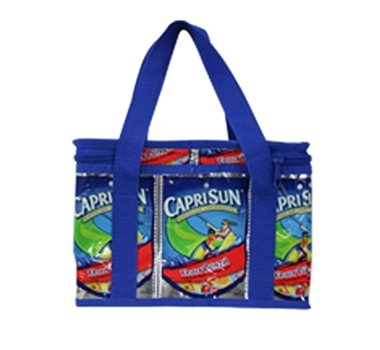 This unique and durable multi-colored Square Recycled Juice Pouch Soft Case Lunch Box is easy to handle and safely secures with a top-zipper closure. The spacious interior accommodates your lunch needs and easily wipes clean with the swipe of a damp sponge. This lunch box is made out of used drink pouches that could not be recycled but are remade into a functional and creative product. The used drink pouches are washed and sanitized before the product is sewn to ensure the cleanliness of this product. This lunch box easily wipes clean with the swipe of a damp sponge. Please be aware that there is some risk of the polyester stitching coming lose or the juice pouches wrinkling upon putting the bag in a clothes washer. Help reduce landfill wastes in a fun and fashionable way! Each year, billions of used drink pouches fill dumpsters and landfills across the United States and are unable to be recycled. This bag uses drink pouches that would have otherwise been thrown away. Done with your lunch box? You can send it back to ensure of its proper disposal. Used products are ‘sliced and diced’ and reformed once again into a useable, recyclable rigid plastic packaging material. Please e-mail us at contactus@theultimategreenstore.com for details on shipping instructions. Please Note: Colors and designs of the lunch box may vary depending on drink pouch availability. Materials: 100% juice drink pouches.